Usable for extended periods when grinding, polishing, cleaning, cutting and engraving. Ideal for mechanics, model builders, jewelers, opticians, artists and electronic enthusiasts. This high-revving motor has full-wave electronic speed control capable of producing variable speeds between 5,000 and 20,000 rpm and is usable for extended periods at a time producing an exceptional power/weight ratio. The streamlined die-cast aluminum head provides a stable housing for the ground steel spindle. It runs in a ball bearing assembly, minimizing play (max. runout 0.001). The tool comes with six high concentricity collets sized 1/32 in., 1/16 in., 5/64 in., 3/32 in., 7/64-inch and 1/8-inch (1.0, 1.5, 2.0, 2.4, 3 and 3.2 mm) along with a collet nut as well as a selection of 34 industrial quality bits and cutters with shanks 3/32-inch (2.3 mm). Professional Rotary Tool IBS/E with 34 Assorted Bits and Cutters Usable for extended periods when grinding, polishing, cleaning, cutting and engraving. Ideal for mechanics, model builders, jewelers, opticians, artists and electronic enthusiasts. This high-revving motor has full-wave electronic speed control capable of producing variable speeds between 5,000 and 20,000 rpm and is usable for extended periods at a time producing an exceptional power/weight ratio. The streamlined die-cast aluminum head provides a stable housing for the ground steel spindle. It runs in a ball bearing assembly, minimizing play (max. runout 0.001). The tool comes with six high concentricity collets sized 1/32 in., 1/16 in., 5/64 in., 3/32 in., 7/64-inch and 1/8-inch (1.0, 1.5, 2.0, 2.4, 3 and 3.2 mm) along with a collet nut as well as a selection of 34 industrial quality bits and cutters with shanks 3/32-inch (2.3 mm). Professional Rotary Tool IBS/E with 34 Assorted Bits and Cutters is rated 4.5 out of 5 by 4. Rated 5 out of 5 by HomeDepotCustomer from Better than Dremel for finer work.... Better than Dremel for finer work. Rated 3 out of 5 by eviluvu from Starting to make a grinding noise I bought this due to a another brand breaking down. I have been using it for a wood sculpture. I use the sanding drums to clean out the burrs and the ragged edges. I am beside myself on how little work these rotary tools can handle. I will be bringing this back tomorrow. Rated 5 out of 5 by Carver from The Proxxon IBS/E Performs Well I have just put my Proxxon IBS/E Rotary tool through its testing procedures and found the results spectacular. I also purchased the 110 Flex Shaft to fit my needs. Compared to a standard dremel rotary tool with flex shaft attachment the Proxxon simply outperforms, hands down. I tested the unit carving 12 Gingko Leaves in Quarter Sawn Red Oak ordered by a customer to add to their trim details in their home. Unlike a standard Dremel, this unit does not heat up the flex shaft and is designed to run continuous. 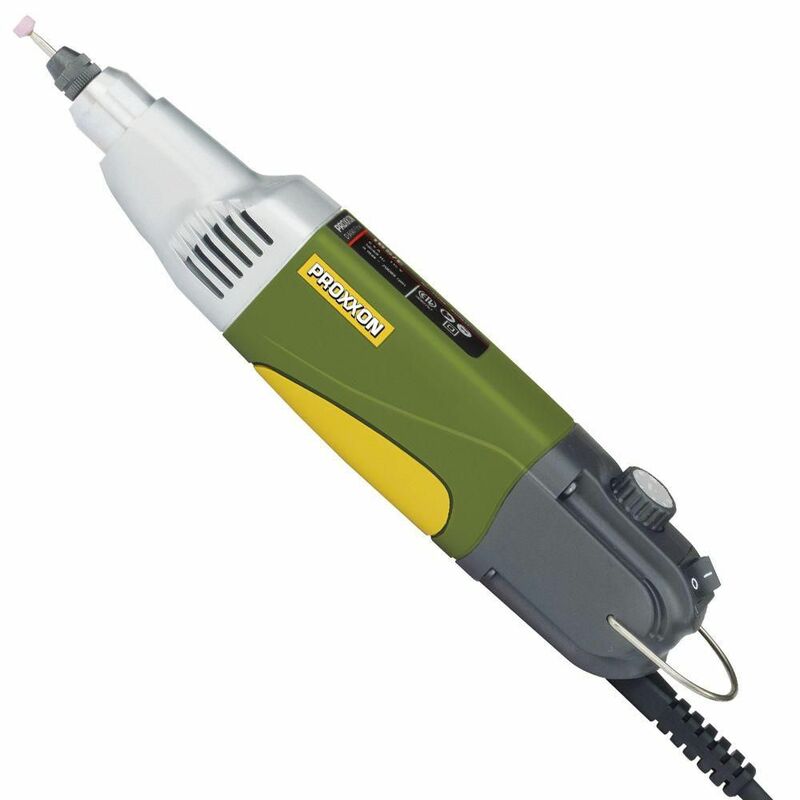 Unlike a standard Dremel this unit has virtually NO Chatter because of its ball bearing design and is about half the decibels that a Dremel produces. As a professional relying on the quality of my tools I will soon add another to my work set up. I would strongly recommend that if you are currently using a standard Dremel then you owe it to yourself to purchase this unit. Dremel Fortiflex is a great tool comparable to Foredom so I do not want to confuse the Standard Dremel with the Dremel Fortiflex.